Genre: Young Adult Contemporary Mystery and Political! “I have a passing fondness for explosions." "Are you threatening me?" the boy asked. The Fixer is the story of Tess Kendrick, a teenager who is forced to leave her Montana ranch when it becomes apparent that her grandfather is no longer able to care for her. Tess moves in with her big sister Ivy, who happens to work with a lot of very influential people in Washington D.C. Ivy makes things happen and Tess seems to follow in big sister's footsteps. Tess doesn't know much about her sister except that she abandoned her years ago, so there are hurt feelings and thus words are said that create tense situations. Anyway, Tess learns about Ivy's job as D.C.'s fixer. You have a problem? You go to Ivy and she'll clear it up for you, the catch is she'll have dirt on you she can use to get whatever she wants. As Ivy Kendrick's little sister, Tess is expected to be a fixer herself, something she realizes as soon as she walks through her new school's doors where all of D.C's elite send their kids. When a classmate's grandfather dies, Tess is pulled into a strange series of events which cause her and her friends to think that something sinister is in play. Political intrigue. Fitted with a Sherlockesque main character and a mystery that will get your brain chugging away. Topped with witty dialogue. 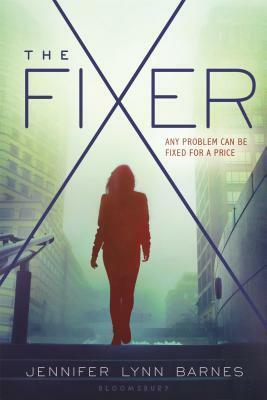 Mix it all together and you've got a brilliantly plotted novel with a genius set of characters otherwise known as The Fixer. "You're telling me that my sister is a professional problem solver?" I asked tightly. "She just goes around solving other people's problems? How is that even an occupation?" "Supply and demand?" Vivvie suggested. "Around here, we call them fixers."